The experience of working at Lake McConaughy is something I’ll hold onto for the rest of my life. I spent a second summer at Lake McConaughy working as a biological technician for The Central Nebraska Public Power and Irrigation District. The gorgeous landscape that surrounds the huge lake is remarkable and the white sandy beaches make the lake unlike any other I’ve seen. The sandy shorelines make an excellent destination for campers and outdoor enthusiasts from all over, but people are not the only ones utilizing the beaches. Piping plovers and least terns are small shorebirds that also call Lake McConaughy home during the summer months. These magnificent birds are ground nesters and the fine sandy beaches of Lake Mac make the perfect habitat in which to hide their eggs. But because the birds share their nesting sites with people who are enjoying the lake, their nests are in danger of accidental destruction from getting run over, stepped on, or destroyed by unleashed pets. This is where my job becomes important. 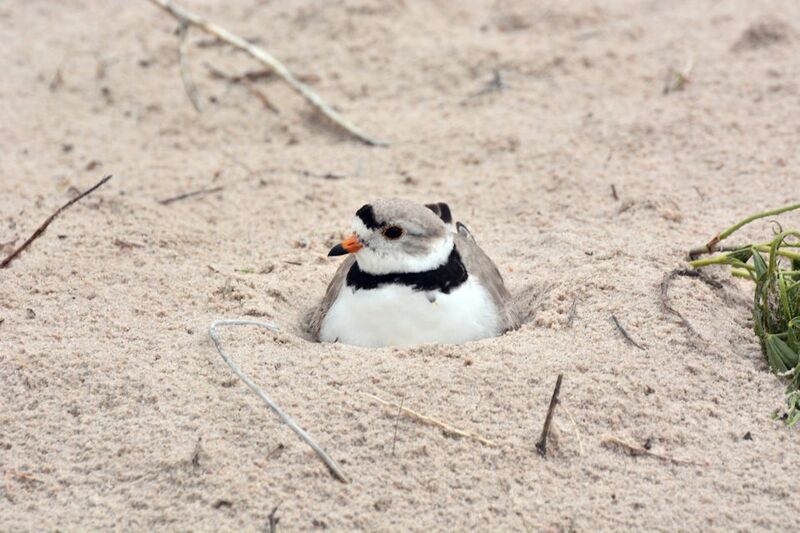 During the early months of the summer – late May and June — a typical day for me would be to survey the beach, searching for plover and tern nests and eggs, which is more difficult than one might imagine. 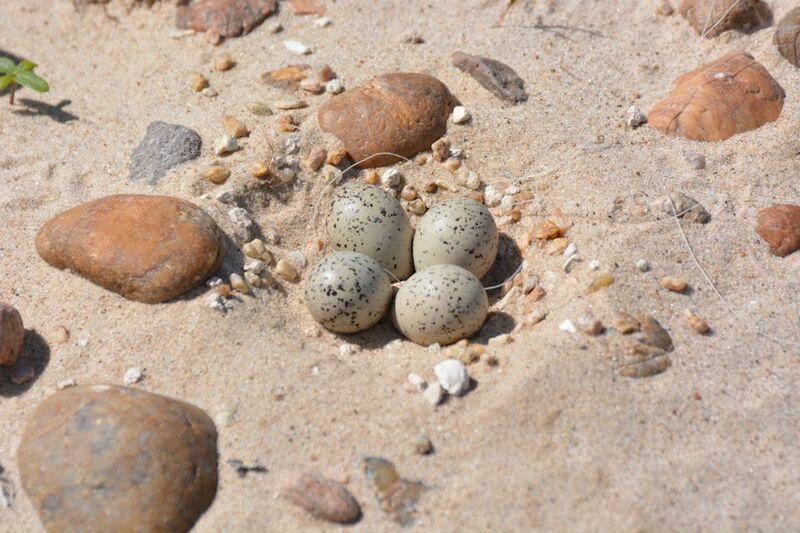 The eggs are slightly smaller than a quarter and blend into the sand extremely well, which is the reason they nest in open, sandy places. Once a nest is located, certain actions must take place to ensure that it has the greatest possible chance of producing eggs and chicks. In areas where human traffic is heavy, an enclosure is constructed around the nest, consisting of orange flagging and signs to make it as visible as possible to beach-goers. The enclosures are large enough that the bird will feel comfortable sitting on the nest as people drive or walk by. In certain areas around the lake where nests are more frequently established, a much larger enclosure is built. These enclosures could have more than ten nests inside them, and make it possible for the birds and chicks to go all summer without human interaction. As the summer progresses, the eggs begin to hatch and then comes the difficult task of keeping track of all the chicks on the beach until they are old enough to take flight. This can be difficult as the chicks can roam a great distance in either direction in a single day. However, this summer was much different than last. Early in the summer, we had many much needed rain showers, causing flows in the North Platte River to rise dramatically. This meant a high volume of water flowing into the lake, which raised its elevation by more than a foot a week. The beaches rapidly disappeared as the birds were trying to find a suitable spot to make a nest. Just as the birds would find a site, the location would become inundated by the rising lake. As days passed, more and more birds left the lake in search of different locations to nest. By the end of the July, which is the natural deadline for these birds to make a new nest, we had no successful nests as the lake rose to 97 percent of its capacity. All suitable habitats were covered by water and the birds were forced to leave without having a successful nesting year at the lake. However, these birds tend to be resilient and will surely be back next year to give it another go! This summer at the lake was one of the most interesting experiences I have had. Watching how the birds reacted to the water rising and seeing them battle each other for territory on what little beach remained was a sight unlike any other. This summer also showed me just how much natural changes can affect the entire ecosystem of the lake. Not only were the birds forced to leave without successfully nesting, but people had to find other areas to park their campers or pitch their tents , which was quite a sight to see. The fishing at Lake Mac quickly became more challenging as the summer went on. As the lake expanded, so did the areas in which fish could forage or take cover. Watching how fisherman reacted and tried new tactics was also interesting to me, as I am an avid fisherman. All in all, one of the most important lessons I learned this summer is that things don’t always go as planned, but you have to be ready for whatever happens and learn to adapt to the situation that you encounter. I am thankful I am able to come away from this experience with such an important life lesson! — Tony Jenniges is a senior at the University of Nebraska-Kearney, majoring in wildlife management with plans to enter a master’s program in the same field. He has worked two summers for Central, as well as a summer internship with the Nebraska Game and Parks Commission. He also has worked for Headwaters, Inc., on tern and plover monitoring at sandpits in the central Platte River area as part of the Platte River Recovery Implementation Program monitoring efforts. In addition, he has participated in whooping crane monitoring by airplane, also a part of the PRRIP monitoring program.